As we approach the end of the week the political rhetoric that has been impacting volatility in recent weeks has started to calm down. Rather than lurch from political comment to political comment, traders are able to sit back and take a broader view of the markets. This, dare I say it, noise-free day in the markets is allowing fundamentals to take centre stage, which has weighed on volatility, allowing risky assets to benefit. But where will they go next? Below we take a look at a couple of developing themes that we think could drive markets in the coming days and weeks. While the pound is benefitting from a weaker dollar and some good economic news, Brexit remains a key unknown for the pound, and this week’s informal UK/EU summit in Salzburg hasn’t given us a clear view that progress has been made. So, far we know that Theresa May and some on the EU side are determined to reach an agreement on Brexit terms ahead of the 29th March 2019 deadline. However, the briefing from the EU negotiator later today should give us an idea about whether the EU are willing to go along with the PM’s Chequer’s plan and make progress with the Brexit negotiations. At this stage, Brexit is a binary outcome: there is a deal or there isn’t. This is why it remains such a risk event for the pound. Right now the better economic data has boosted the chances of another rate hike from the BOE in February next year to more than 30%, a 10% jump in probability in a week. This has undoubtedly supported the pound’s recent rally. However, signs that the EU won’t give Theresa May what she wants could see a dramatic lowering in future rate hike expectations, as it is very unlikely that the BOE will hike rates if a ‘no deal Brexit’ is likely. Caution is also being exercised in the bond market, as you can see below. The chart shows the UK-US 10-year government bond yield spread and GBP/USD. They have diverged in recent days, with the pound accelerating, while the UK-US yield spread has started to widen once more. For the pound’s gains to remain sustainable, we may need to see a further narrowing of the yield spread. This suggests that GBP/USD gains could be capped ahead of $1.3305, the 38.2% retracement of the April high to August low in GBP/USD. We have pointed out before the broad-based nature of the rally in the S&P 500, although there have been periods of weakness for some sectors’ of the S&P 500 in the last few months, overall, stocks have done well, led by financials and tech stocks. However, there are signs that investors are getting more cautious even as US stocks remain close to the August 29th record high. Firstly, there has been a divergence between the S&P 500 and the Russell 2000 (the US small cap index). As you can see in the chart below, the Russell 2000 has started to fall back from its end of August high, while the S&P 500 continues to rally. This alarming since the two indices had been moving together in lockstep for most of the last year. 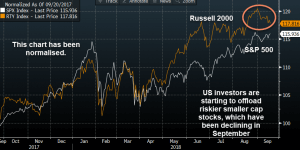 The Russell 2000, which is made up of riskier stocks compared to the S&P 500, had started to outperform the S&P 500 since May, as you can see in chart 2 below, which has been normalised to show how they move together. The fact that investors are ditching higher-risk stocks, suggests that risk could be going out of fashion. Holding onto cash also seems sensible in the current environment, as you can see in the chart below. It shows the spread between the US -3 month Treasury bill yield and the S&P 500’s dividend yield, which has risen to its highest level since 2008 – the peak of the financial crisis. This comes as US 4-month bills are selling for a yield of 4%, while the S&P 500 dividend yield is a mere 1.8%. 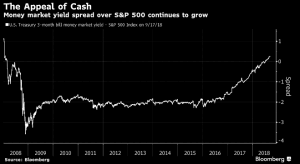 Thus, a move into cash seems like a no-brainer for yield-starved investors, and cash is significantly less risky than stocks. Thus, as long as the Fed continues to signal that rates will move higher, then we expect this spread to remain in favour of holding cash, which could limit further S&P 500 upside in the near future.